Published by Arley Hall Press, Charles Foster's books are based on study of the Arley Hall archives and provide much background information which will make understanding the archives easier. The books are available mail order from this website. Charles Foster's new book The Flowers and Ashbrooks of Durrow is now available from this website as a downloadable PDF document. (1992) 88 pp., 7 maps, 5 b/w illus., 25 x 17 cm, paperback. ISBN 0 9518382 0 2. This is a unique snapshot of rural life in the eighteenth century. 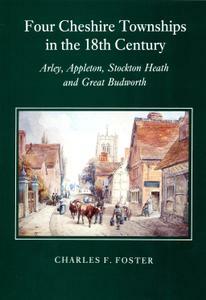 It details the lives of the residents of 8,600 acres in the four townships - from Sir Peter Warburton of Arley Hall to Jonathan Berry, a sheep shearer. Extraordinary details of these people's incomes and occupations have survived in rare tax returns, maps, rentals and deeds in the Arley Hall archives. Foster uses the splendid records of the Arley estate, together with the excellent tax and survey material for other properties, to repopulate most of the farms and houses and offer thumbnail sketches of the fortunes of many of their families.... Although this work is clearly, in part, one of local heritage, it is also informed by recent scholarship and strives to see analytic patterns among the detail so lovingly marshalled in the many tables, maps and appendices.The most important of these concern the continual breadth of land ownership in the 1740s and the circulation of wealth, via portions for children, mortgages and marriage between the land and urban trades. Despite its brevity, therefore, this well-written study offers data and suggestions well worth the consideration of economic and social historians. Jonathan Barry, University of Exeter, History, 1992/3. To order on-line, click the Buy Now button above. Secure payment from your debit or credit card is handled via Paypal (you do not need to have or create a Paypal account to use this service). To order by post, please write to Arley Hall Press, Northwich, Cheshire, CW9 6NA, stating your name, address and contact number and the title(s) you wish to purchase. Please see the options above for prices and include a cheque for the total amount, made payable to Arley Hall Press. For any further information or enquiries, please contact us.